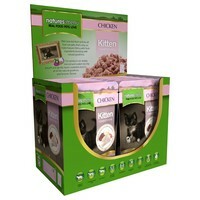 Natures Menu Kitten Food Pouches (Chicken) are complete and balanced meals made with a minimum of 70% chicken for kittens aged from 8 weeks. Filled with top quality raw ingredients and then steam cooked once to ensure the food is as natural as possible, each Pouch of Natures Menu contains a wider range of nutrients your kitten needs for health growth and wellbeing. Chicken is a delicious light meat that is easily digested. It contains many B vitamins and useful amounts of Iron, Zinc, Phosphorus, Selenium and Potassium.